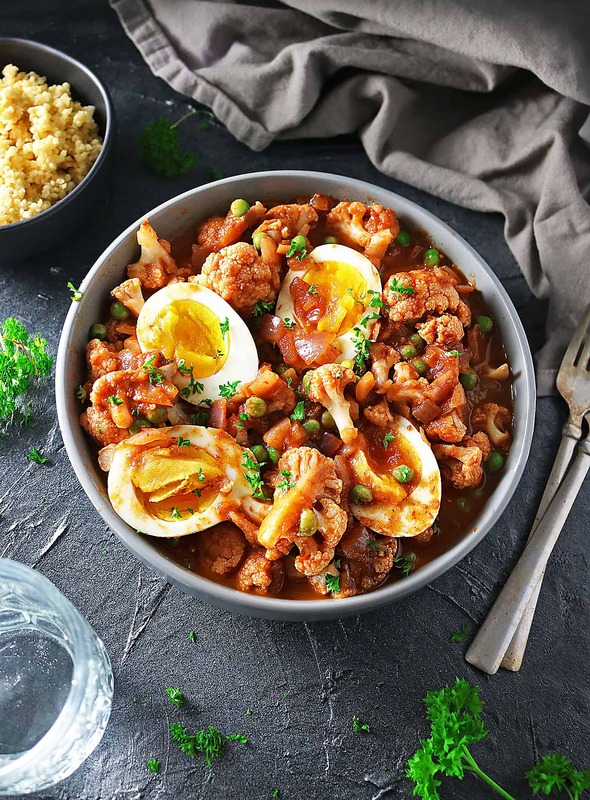 Sweet Raspberries, honey, caramelized onions and chipotle peppers in adobo sauce make up the sauce that’s used in this oh-so-tasty, not-to-spicy, yet super-Easy Raspberry Chipotle Cauliflower Curry With Boiled Eggs. Y’all, I am so ashamed. This year for lent, I resolved to give up chocolate. Prior to lent beginning, I made sure to get rid of ALL the chocolate in my house (even my dogs couldn’t find a stray chocolate chip anywhere). I made sure I didn’t bring home any of the chocolate covered, chocolate hazelnut stuffed, strawberry truffles that I made for a little get together on Fat Tuesday. Y’all, I thought I was all set for 46 days of NO chocolate. Then, a few days after, I drove by a Starbucks on my way to Sprouts and, I swear, their blonde mocha called out to me! On my way back from Sprouts, I was pretty proud of myself for not accidentally turning into ‘Bucks and ordering myself a mocha. But, when I got home, all I could think of was a mocha! I had gotten rid of all the chocolate chips – buuuuuut, I ran into a can of cocoa powder in my pantry I had forgotten about… at least that was until that mocha craving came calling! And… the next thing I knew… cocoa, coffee and sugar were dancing in a cup of steamed dairy free milk that accidently managed to sneak through ma lips, swirl around my tastebuds, and mosey on down to ma belly! GAH – I lasted four days without chocolate – 4 days instead of 46! I guess I learned that I can give up sugar easier than I can give up chocolate -or any form of it! Oh well… live and learn I guess… and then make a Raspberry Chipotle Cauliflower Curry so tasty it helps me forget my total lack of self control when it comes to chocolate! 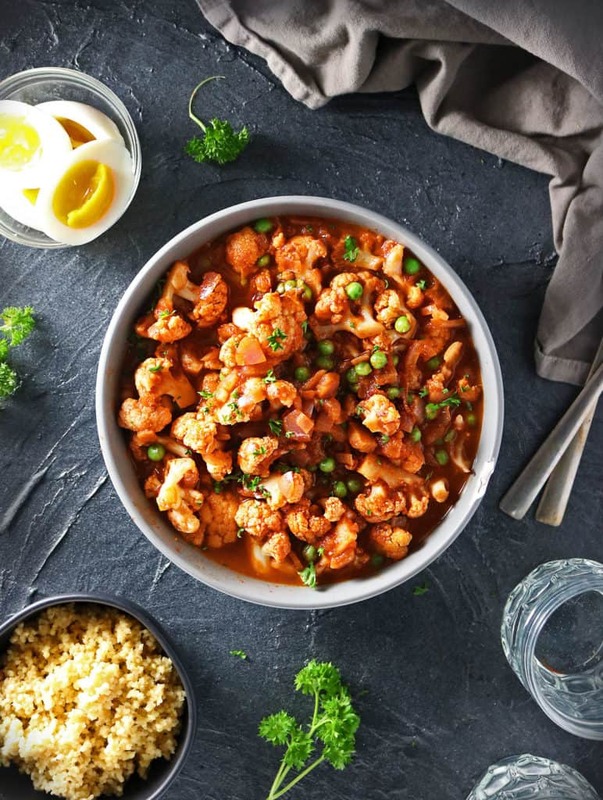 Earlier this month I shared a recipe for an Easy Raspberry Chipotle Chicken Curry on here. 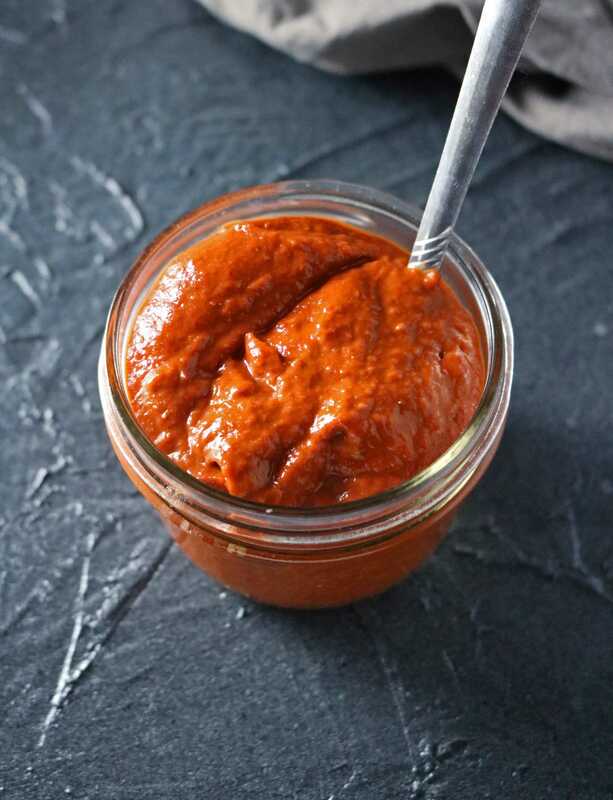 In that recipe, I used a cup of a spicy and sweet, raspberry chipotle sauce that was made using a WHOLE can of chipotle peppers in adobe sauce. But, after making and devouring that chicken, I still had a cup of that raspberry chipotle sauce left. Not meaning to throw it in a container and freeze it and forget about it (like I usually do with any leftover chipotle peppers in adobe sauce), I used it to make this Easy Raspberry Chipotle Cauliflower Curry With Boiled Eggs. While I opted not to dilute the raspberry chipotle sauce in that Raspberry Chipotle Chicken Curry (which resulted in a very thick curry that was perfect to scoop up with roti), I did dilute that raspberry chipotle sauce in this Raspberry Chipotle Cauliflower Curry with some vegetable stock. I also added in some onions, ginger and garlic as well, which was in addition to what was already used to make the raspberry chipotle sauce. 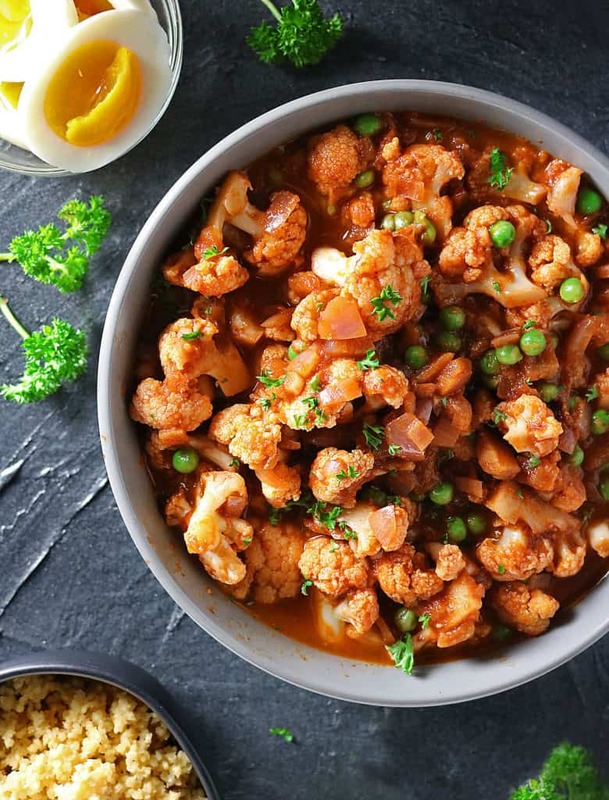 I ended up boiling some eggs and adding them to this curry too – for a protein boost, but if you opt not to, then you have one heck of a flavorful and easy, vegan Raspberry Chipotle Cauliflower Curry to enjoy. My daughter remarked that curries like this make it easy for her to get her daily allotment of fruit and veggies in! 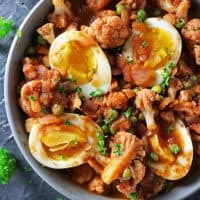 If you happen to have a can of chipotle peppers in adobo sauce, raspberries, onions, garlic, ginger and some cauliflower (or any other veggies or meats) lying around, I sure hope you give this Easy Raspberry Chipotle Cauliflower Curry With Boiled Eggs or any other version of it (depending on the veggies/meets you use). And, if you do try it, please do let me know in the comments below or by tagging @SavorySpin and #savoryspin on Instagram, Facebook, and Twitter! Add olive oil to a pan over medium heat and add the onion to it and saute about 10 minutes. Then, add in the ginger and garlic and saute a couple more minutes. Add in the raspberry chipotle sauce and vegetable stock and mix well. Then add in the cauliflower florets, stirring the florets to make sure they are all covered with the sauce. Cover and let cook about 15 to 20 minutes (until florets are tender). Add in the peas and stir a couple more minutes. Then, season with salt and pepper to taste (as needed). Halve the boiled eggs and add them into the curry too. Then garnish with parsley and enjoy with roti or millet (like we did), rice or quinoa. wow -this is a great ingredient, healthy and so delicious!! I wouldn’t have lasted too long either if I had to give up chocolate, which is why I didn’t, lol. Giving up chocolate sounds like torture!! On the other hand, the flavors in this dish are phenomenal!! I gave up Lent for Lent – so no worries about accidentally eating chocolate or anything else. 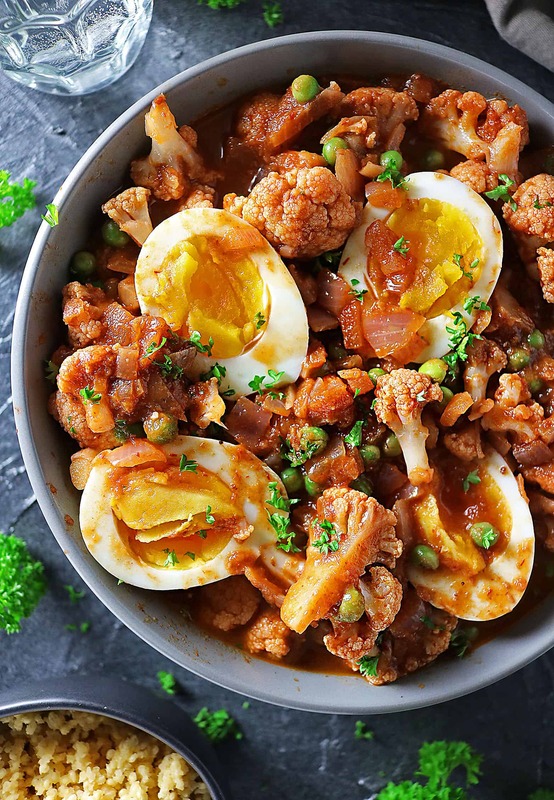 This curried cauliflower definitely needs to be on our agenda this weekend. I love the flavors in this! Sweet and spicy is the BEST ever! Haha…I’m proud of you for making it 4 days, Shashi. That’s virtually a lifetime when we’re talking about no chocolate. 🙂 And I’m all about that homemade mocha, too. I bet it tasted amazing! Speaking of tastes, this recipe sounds delicious. You’ve got so many fun flavors going on in there, but the raspberry + chipotle combo is what’s making my mouth water right now. Looks amazing, my friend! I hope you and Lil Shashi have a wonderful, chocolate-filled weekend! You had my attention the moment I read raspberry chipotle adobo sauce. I’ve made chipotle type sauces with fresh cherries before, but never raspberries and I LOVE raspberries. In fact, I have a raspberry bush in my yard so I know what I’m making for dinner come raspberry season! PINNING!